Get Vendio Gallery - Now FREE! 2012 Bowman MLB MASSIVE 6 Box Jumbo Rack Factory Sealed CASE. The Product of the Year! 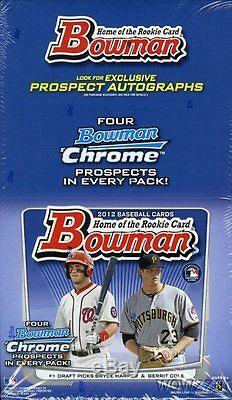 We are Proud to offer this Original Factory Sealed CASE of 2012 Bowman Baseball!! This MASSIVE Factory Sealed CASE includes SIX (6) HUGE Factory Sealed Jumbo Rack Retail Boxes! Each Factory Sealed Box includes 18 Packs and 20 Cards Per Pack!! That is HUGE 320 Cards per BOX and 1,920 Card in this MASSIVE 6 Box Factory Sealed CASE!! Every Year this Product is a HOME RUN!! 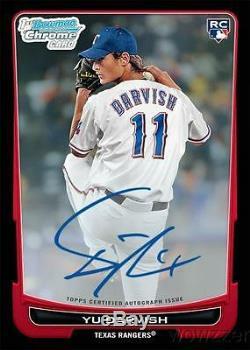 Look for Autographs of SUPER ROOKIE- YU DARVISH and BRYCE HARPER!! Look for Retail Exclusive Autographs and Inserts that can only be Found in this Product!! PLUS EVERY PACKS includes a EXCLUSIVE BOWMAN GREEN PARALLEL Card that can only be found in this Jumbo Rack Product!! You get 18 EXCUSIVE GREEN PARALLEL Cards in every box and 108 in this Case!! Complete Details of Product Below! 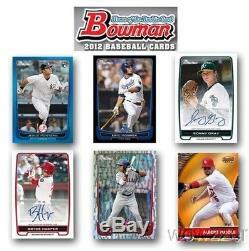 10 2012 Bowman Baseball Cards per pack. 4 Bowman Chrome Prospects per pack. 1 Base Gold Parallel Card per pack. And 1 EXCLUSIVE BOWMAN GREEN PARALLEL! Blue-Bordered Parallel numbered to 500. Orange-Bordered Parallel numbered to 250. Red-Bordered Parallel Sequentially numbered 1/1. Die-Cut Refractor numbered to 99. Die-Cut X-Fractor numbered to 25. (110 Subjects): BCP1 - BCP110: 2 per pack. Refractor Parallel numbered to 500. Blue Refractor Parallel numbered to 250. Purple Refractor Parallel numbered to 199 RETAIL ONLY! Gold Refractor Parallel numbered to 50. Orange Refractor Parallel numbered to 25. The flag of where the subject was born. 190 veterans and 30 Top Rookies. International Parallel Featuring the flag of the player's home country. Be Sure to check out our many other Items!! We stock a Huge Selection of Factory Sealed Boxes from every Sport! Plus the Largest Collection of Graded Cards in the World! Wait to pay until all items have been won OR 7 days after oldest item was won. (Please Note - we are not open on the Weekends and Holidays). We will NOT list a lower value or mark orders as gifts. We answer all emails within about 24 hours, Monday through Friday, and work to resolve all problems as quickly as possible. Unless an item is damaged, it generally needs to be in the condition it was received, either undamaged or factory sealed, to be eligible for a return. Note on Factory Sealed Boxes and Cases and Graded Cards. On listings for a factory sealed box or case, any cards shown are images of manufacturers samples and are not guaranteed to be in any particular box or case. On Listing for Beckett BGS Graded Cards. Sellers: Get your own map today. The item "2012 Bowman MLB MASSIVE 6 Box Jumbo Rack Factory Sealed CASE" is in sale since Tuesday, December 29, 2015. This item is in the category "Sports Mem, Cards & Fan Shop\Cards\Baseball". The seller is "wowzzer" and is located in Santa Ana, California. This item can be shipped worldwide.